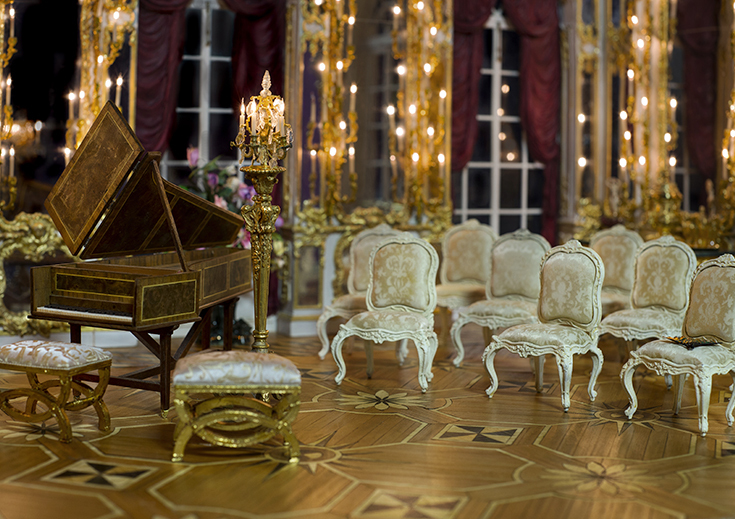 The Catherine Palace was a donation to the KSB Miniatures Collection from collector Carole Kaye. A new year always brings new beginnings, new adventures, and new memories to create and this year is starting out with a bang as the collection debuts its newest acquisition, Catherine Palace. Like some of life’s greatest gifts, it came to us as a surprise. Collector Carole Kaye, who commissioned Robert Dawson of the Modelroom to create the 1:12-scale reproduction inspired by of one of the world’s most opulent and storied castles, generously donated it to us and we are in the process of assembling it for its January 26th premiere. Ironically, I saw this piece as a work-in-progress at Kensington about ten years ago. Even in its incomplete state I was overwhelmed by its grandeur and I never imagined we would one day be displaying it in the collection. The new exhibit is significant for several reasons. Personally, I never thought we’d have the opportunity to own a work by Robert Dawson, but aside from that, this one-of-a-kind piece has never been publically displayed. I’m thrilled it will make its first appearance at the museum. It also adds a historical aspect that wasn’t covered in our collection—18th century Russia. And what a history the real Catherine Palace has! Intricate parquet floors and several hundred miniature candle lights add to the grandeur of the Great Hall. Originally constructed in 1717 for Peter the Great and his wife, Catherine I, it started out as a modest structure surrounded by trees on the banks of the Neva River near St. Petersburg, Russia. While the couple enjoyed the solitude and simplicity of the home, their successors did not and commissioned numerous expansions—the most extensive ones ordered by their daughter Empress Elizabeth I over her twenty-year reign. Her vision was for the home to become a grand residence to rival Versailles. 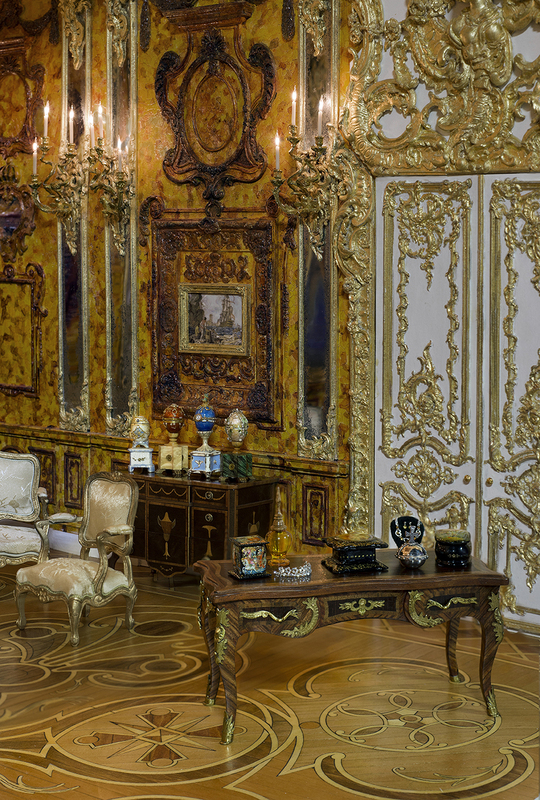 The result was a blue-and-white Baroque fairy-tale castle studded with more than 220 pounds of gold gilt. And that was just the exterior. As you can imagine, her lavish tastes extended to the interior, as well. Later, after her daughter-in-law, Catherine the Great, overthrew her own husband and began her rule, more additions were made to reflect her predilections. Throughout the years and the wars the palace would be destroyed and rebuilt several times but its captivating story continues to inspire. It’s a fascinating look at history, and the lives of its famous occupants are equally intriguing. My hope is to bring their remarkable stories to life with the exhibit, which features six furnished rooms. Robert went to great strides to authentically create the miniature and spent many hours in Russia during his research. 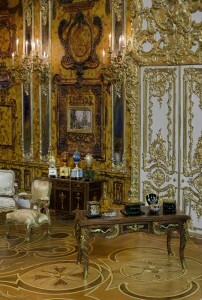 Of special note is his reproduction of the famous Amber Room. The original contains mosaic panels of amber framed with mirrored pilasters, gilded carvings, and sconces. The room “vanished” during World War II but prior to being dismantled and moved it was considered the “eighth wonder of the world.” After decades of work, the room was reconstructed at a cost of 12 million dollars and opened to the public in 2003. Robert’s carefully executed interpretation of the Amber Room was created in steps. After the architectural decoration was applied, the pattern for the amber was engraved into the surface of tiny pieces, each no more than about an eighth of an inch, and then individually painted to replicate amber. Thin layers of varnish were then built up over the pieces to give the depth and translucency of the fossilized gemstone. I could not have expressed it more eloquently and now the piece will join other historically significant miniatures in the collection that offer viewers a unique look into history by seeing how those before us, and in other parts of the world, lived. I hope you will join us between January 26th and June 10th to see this magnificent piece, which is truly an exciting addition to the collection. Wishing you all a wonderful new year filled with new beginnings, new adventures, and new memories to create! 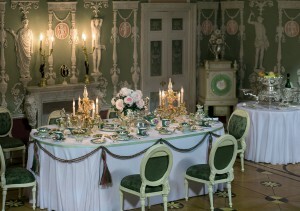 The table settings by Miyuki Nagashima replicate the Sèvres Green Ware that Catherine the Great may have used during her reign. 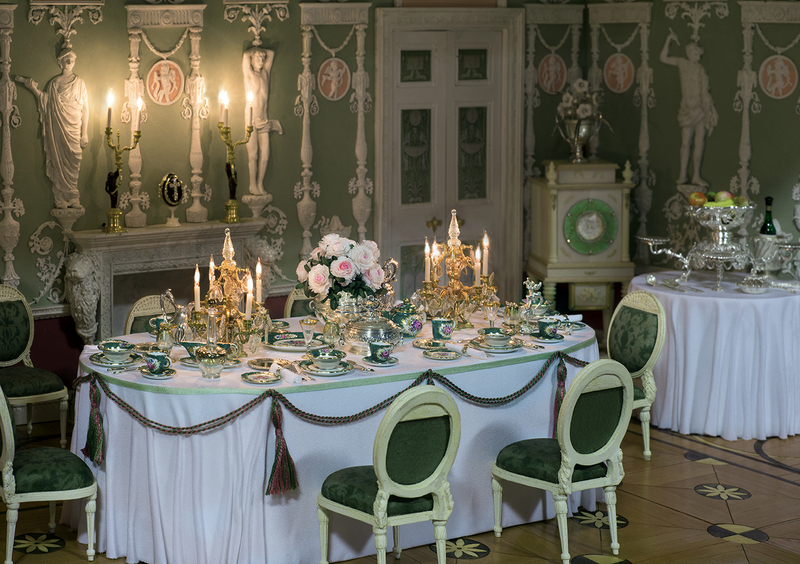 See rooms of the real Catherine Palace here. Will the Catherine Palace remain at the museum after this, or travel? My husband and I had all good intentions of driving out to Maysville to see it, but work/family/health got in the way. I know we won’t get there before the end of the month. But I do hope there will be another opportunity to see it at some point. We did travel to Maysville to see your collection last September and came away awestruck. We spent most of a day looking, and looking again. How fabulous of you to share with all of us! 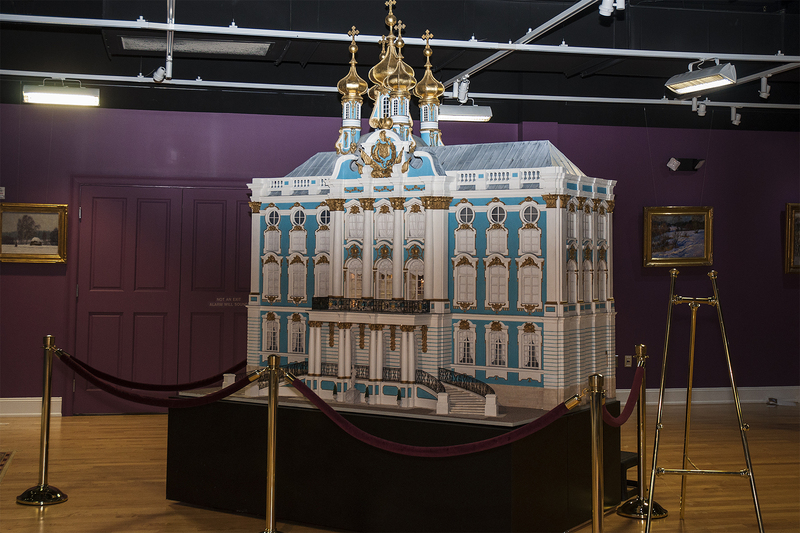 Hi Karen, just wanted to let you know that Catherine Palace will again be on exhibition in the KSB Miniatures Collection at the museum from Oct. 31, 2017 to Jan. 20, 2018. It will be decorated for the holidays along with all the other displays. Hope you can make it! 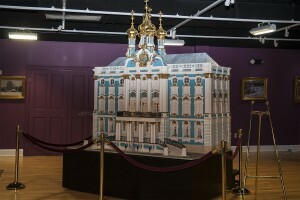 When will Catherine’s palace be on display again? I would love to see it! It is due to go back on exhibit Oct 2 for 8 months! Hope you can come!